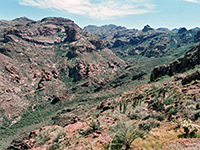 Apart from the Ajo Mountain Drive and the Puerto Blanco Drive, the only other maintained road into the superb backcountry of Organ Pipe Cactus National Monument is to the head of Alamo Canyon; this is one of the larger ravines in the Ajo Range, the jagged mountains that form the eastern boundary of the preserve. 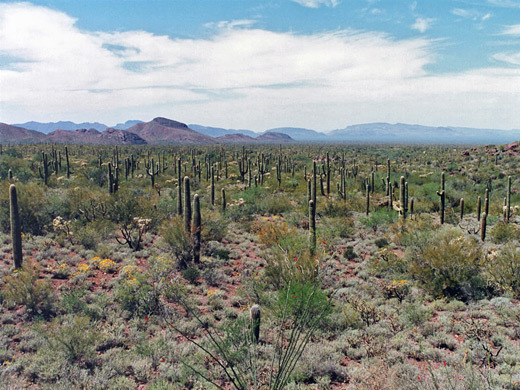 The road is a wide, somewhat bumpy gravel track that leaves AZ 85 between mileposts 65 and 66, and for 4 miles climbs gently to 2,320 feet, crossing desert filled with cacti as varied and densely-growing as any other place in the monument (see 360 degree panorama). 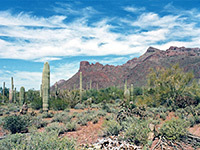 Organ pipes are plentiful, as are saguaro, opuntia and echinocerei. The track ends at a parking area and a small primitive campground - together with the main site near the visitor center, these are the only two places in the national monument where vehicle-based camping is permitted. Desert beside the track, hills above Alamo Canyon. 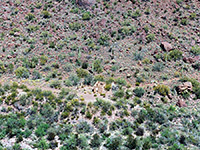 Running parallel to the track just to the south, Alamo Wash is a seasonal stream that only flows after recent rainfall from the nearby canyon, which can be explored by a short footpath. This starts off wide and level - it was once a jeep track, leading through the relatively open land of the lower canyon, past the ruins of an old stone building and a disused well; the walk is easy but has no shade. After about one mile the trail becomes less clearly defined, and merges with the rather overgrown dry streambed. Not far upstream, the main canyon narrows and divides several times. A good vantage point can be obtained by climbing the hillside to the south; this is not too difficult and after ascending a few hundred feet one obtains excellent views over the desert to the west (see 360 degree panorama). The cacti on the hillside seem especially pristine and there is also a good selection of wildflowers, but not much sign of wildlife.